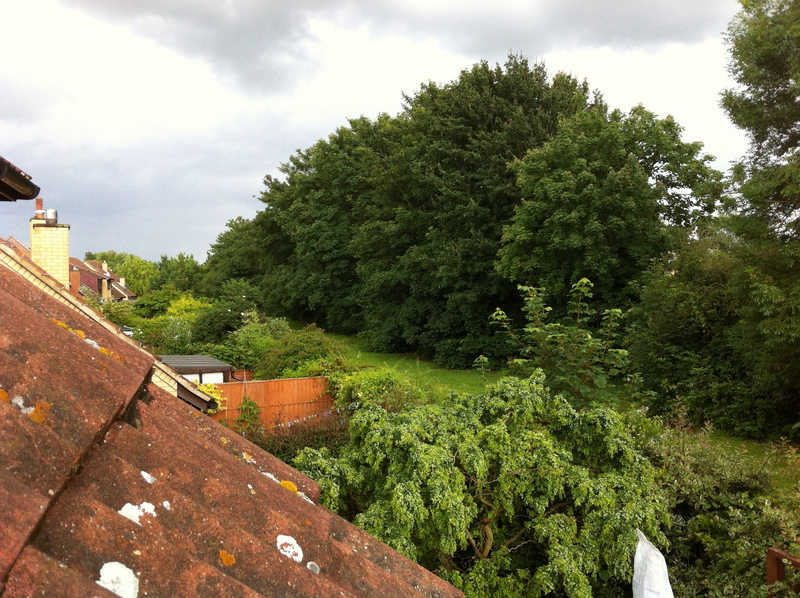 This is a view out of the Velux from the bedroom window. You can see a wavy line of staggered semi-detached houses, their back gardens ending with a hedge, then a strip of grass then a row of mature trees. In all, the view could be a lot worse; it could look out onto yet more bland housing or unsightly industrial buildings. What is the economic value of the line of mature trees behind these houses? That may sound a bizarre question to ask, but that is exactly what a couple of UK government committees have been given the task of doing. More generally, they are to put a number against the value of the UK countryside and urban greenery. No kidding, it’s been on the radio. There will be many more points but it is jarring to think of this stately line of trees in this way. Given the environment these trees create and how they enhance not just my garden but my quality of life – I would say these trees are priceless. Mmmm. I “borrow” a stand of around 6 Scots Pines at the end of my garden, plus a large Beech. They are in others gardens, but have tree preservation orders, so baring accidents, they complete my view. I don’t think of them as money, just a continuation of my view. In your case, who owns the strip of grass, and who mows it? Lovely trees though…. how lovely to have them. I can’t think of the trees in cold hard money terms, it’s so strange. The strip of grass is actually the local council cemetery – we actually back on to a cemetery – the graves start beyond the trees. Although it sounds really spooky, you don’t really see it from the garden because of the trees and I got used to the idea very quickly after I moved in. The cemetery itself is actually quite large, but well maintained, it’s not like the ones you see in the films and it’s much better than looking at more housing. I suppose the trees also have value as carbon sinks and perhaps reducing cooling costs in the houses. Regardless, I agree with you that you can’t really monetize their value. My question would be, why does the government want to spend resources to do so? Having live outside of London for a couple of years I can understand how much you love your leafy view. I now live in the North Carolina mountains where we worry about bears and tress falling on the house! Anyway, I also love roses and all my David Austins are very happy living on high. I was delighted to discover your blog through Jean’s Garden and look forward to visiting again soon. Hope you got a good bear-proof fence then! I’ve bought four bare-root roses in all, three are thriving, one is pending replacement this November since it died. I wish I could get lots more but they are quite expensive and I don’t have the room (yet?). Anyway, thanks for stopping by, I hope you find my posts and pictures enjoyable and entertaining. I’ve actually come across your site before and have known about it for a while so it’s really good to see you here, I’m going to bow to your superior writing, gardening knowledge and feel slightly star-struck.